EoL NOTICE: The Lx series is going End of Life with a last buy date of the 30th of June 2019 with last shipments at the end of 2019. The suggested replacement is the California Instruments Asterion series. The Lx Series represents a modern AC power source that addresses increasing demands on test equipment to perform more functions at a lower cost. By combining a flexible AC power source with a high-end harmonic power analyzer, the Lx Series systems are capable of handling applications that would traditionally have required multiple instruments. The Lx Series is completely microprocessor controlled and can be operated from a simple front panel keypad. A pair of analogue controls located next to the backlit alphanumeric LCD display allows output voltage and frequency to be slewed up or down dynamically. 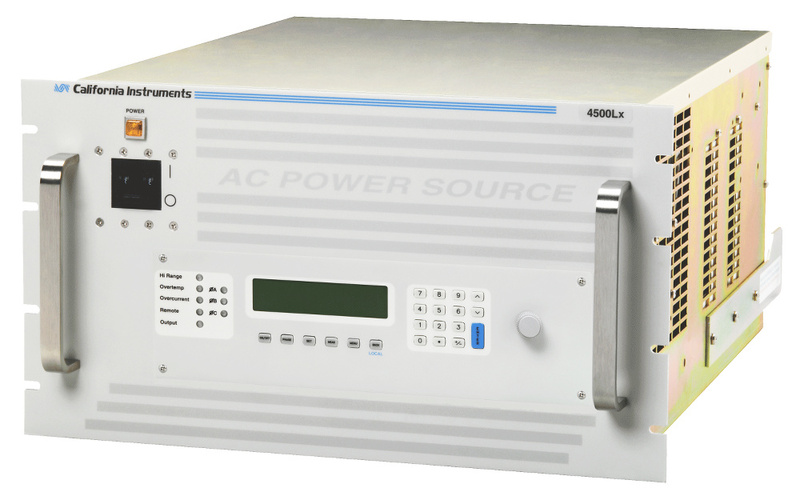 With precise output regulation and accuracy, high load drive current, multi or single phase mode and built-in power analyzer measurement capabilities, Lx Series AC source/analyzers address many application areas for AC power testing. Additional features, like line arbitrary waveform generation and available DO 160 or MIL 704 test standards, make the Lx Series a good choice for avionics or defence applications. All Lx Series AC sources are equipped with IEEE-488 (GPIB) and RS232C remote control interfaces and support SCPI command language programming.